The box says that this cereal got its taste from sailing up chocolate rapids and through sprinkle falls. I say it got its taste from sailing down "boring river". The chocolate flavor isn't nearly as "chocolaty" as Cocoa Puffs or Cocoa Pebbles, and the chocolate milk it produces is minimal. I will say this for the Captain's new creation: it definately holds it's crunch. In fact, the colored sugar sprinkles gave each nugget a secondary weird crunch that I didn't care for. If you're after the crunch, give it try. If you're in it for the taste, try another chocolate cereal or one of the Captain's non-chocolate varieties. Mr Breakfast purchased a 13 ounce box. What do you think of Cap'n Chrunch's Oops! Choco Donuts? I would love to try it. I am devastated Sprinkled Donut Crunch has been taken off the shelves. If I only knew it was going away I would've bought every box and cherished every single piece. I had an absolutely amazing and this one sounds good. Bring it back. Bring them both back. You have something great. I don't eat Cap'n Crunch so good. 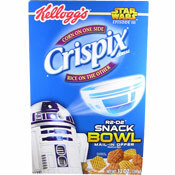 Please, for the love of God, I beg they bring this cereal back. OMG. I'm gonna die without it. I remember every bite filled with chocolate crunchy goodness. Bring Back these Choco Donuts! Aw man, this stuff was good! We need it back! We don't need Cap'n Crunch Special Edition... We need THIS! 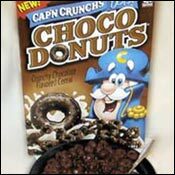 I really want to eat this Cap'n Crunch Oops Choco Donuts again. I miss the taste of it so much! Please bring this product back. Please bring this cereal back. It was my favorite cereal. I miss it so much! I miss this cereal so so much! This cereal was super good! Bring it back! You just gotta! Where can I find them again?! I love them! They were so good! URGENT! PLEASE help me find them! Never had it but it looks like something I'd like. This was the best cereal I've ever had in my life. When it was discontinued it took a piece of my heart with it. I can't find this ANYWHERE!! I LOVE this stuff! The guy up there is just tering down good food, I just hate that it's discontinued. In Washington, they were only out for about 3 months. I had Choco Donuts and Gatorade my entire 10th grade summer. I would eat at least 3 bowls for breakfast and lunch, and a few after dinner on a late night. It was so goodddddddd. Seriously, I can still remember the taste, and I know I would go back to doing that summer all over again. I miss it pretty badly. Wish it were still around. This cereal tastes like a real chocolate-frosted doughnut. I actually enjoyed this cereal. We must always remember that tastes vary from person to person, so there can never be a definitive review on such foods. I found Choco Donuts to be a good, if not a very small bit disappointing, addition to my morning lineup. I'm saddened to see them discontinued.